What Is the Women's Dance? 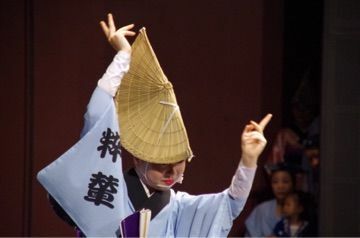 Onna means woman, Odori means dance. The woman's dance is similar to line dance. It involves dancers standing in one or more lines performing different choreography. The movements have some patterns with different sequences. Each Ren(group) has their own formation. It is one of the points to watch the women's dance. Their steps is small because they wear kimono. They keep holding their arms up during the dance. Women’s dance needs a lot of practice because they need to learn many choreographies. 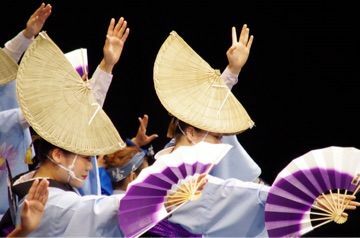 The women dancers wear kimonos or yukatas, the summer kimono, but the style is different than the usual kimonos and yukatas. They leave a large opening at the back of the neck of kimono. The back shot is really beautiful and elegant. They wear white arm covers to hide their skin. The undergarments used in wearing traditional Japanese kimono was used as the dancers' primary costume especially the skirt. They use a summer kimono belt where the belt is smaller than usual. They put on a rush hat and cover half of their face with it. They dance on their toes in Geta sandals, just like the ballerinas where they usually lift their toes when dancing. They need a lot of practice to perform this move with their toes. Who Can Join the Women’s Dance? Only Women can join the Women’s Dance. Each Ren has their own rule about age limit. For example, from 12 years old to 29 years old. Some Ren don’t have any limit. It totally depends on the Ren. Awa-Odori is one of the famous Japanese dances. 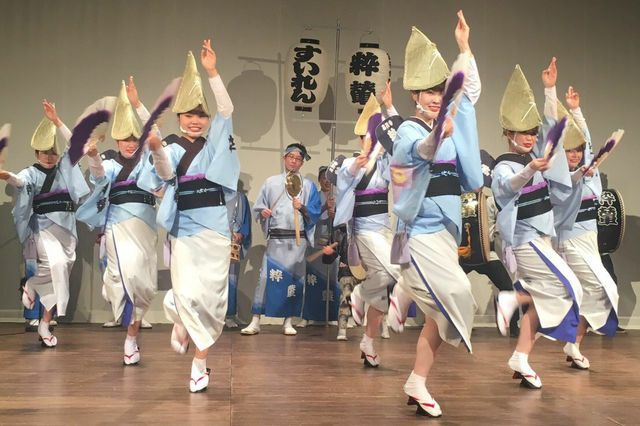 It originally started from Tokushima Prefecture in Shikoku Island in Japan.Tokushima was called “Awa”, so the dance seems to be named after it. 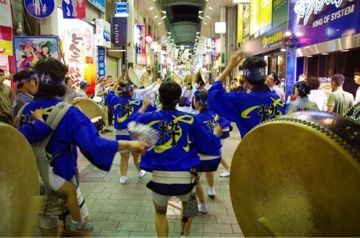 Nowadays, the Awa Dance festival is not only held in Tokushima but in many other cities as well. The origin of Awa-Odori is not sure. There are several possible origins of it. One of them is rooted in Bon-dance. Bon is a holiday that we celebrate the return of our ancestors, like Halloween. We perform Bon-dance during the holiday. Awa-dance might originate from it. 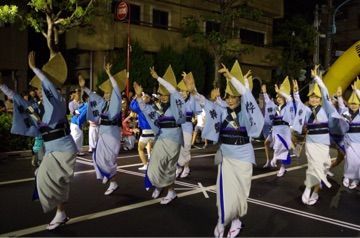 The other origin is from the celebration dance for a new Tokushima-castle. The castle was built in 1587, people in the city danced to celebrate it. The last origin came from the same source as Nho. 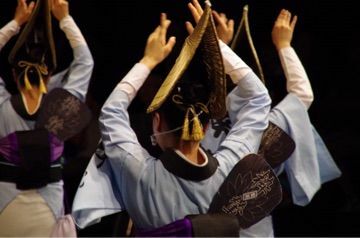 Nho is a traditional Japanese musical that started from 14th century. This dance performed for more than 400 years. 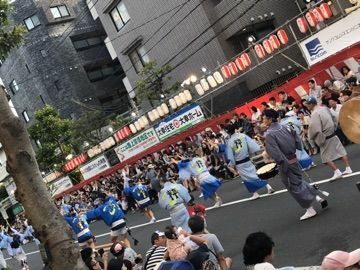 The biggest Awa-dance festival in Tokyo is Koenji-Awa-dance festival. Koenji is in Suginami Ward, Tokyo. It's started in 1957. The number of people who join the festival is getting bigger and bigger. 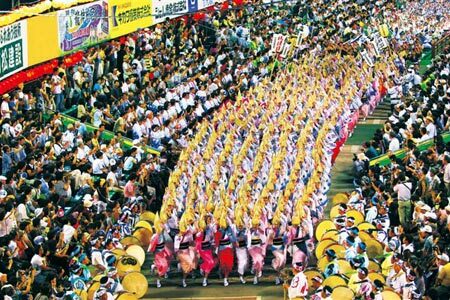 More than 10,000 dancers perform and about 900,000 people visit recently.